In the Slovak/Ukrainian/Carpatho-Rusyn Orthodox Christian tradition, sour mushroom soup, or machanka/mačanka, is a meatless soup served for Christmas Eve velija supper and also any time fasting is required, like Advent and Lent. It's a hearty soup made with woodsy dried mushrooms that must be reconstituted by soaking overnight, so plan accordingly. In a medium bowl, place 2 ounces dried mushrooms and 2 cups warm water. Cover with plastic and let soak overnight. The next day, remove the mushrooms from the soaking liquid without disturbing the sediment at the bottom and chop them into small pieces. In a large pot, carefully pour in the soaking liquid without disturbing the sediment at the bottom, the chopped mushrooms, 4 cups water, 1 whole peeled medium onion, and salt and pepper to taste. Bring to a boil, reduce heat and simmer 1 1/2 to 2 hours or until mushrooms are tender. Remove onion and add 3/4 cup sauerkraut juice or to taste. In a small skillet, brown 1/4 cup flour in 1/4 cup oil until a dark brown roux is achieved and add to soup, whisking until smooth. Temper the mixture of 1/2 cup flour and 1 cup water by adding a little hot soup into it, whisking until smooth. Pour the tempered mixture through a strainer back into the hot soup, stirring constantly. In a large skillet, add 1 to 2 tablespoons canola oil and brown, 1 large thinly sliced onion until dark brown and caramelized. Set aside. When ready to serve, add browned onions to soup, mixing well. Pour into a heated soup tureen or ladle into heated soup bowls. 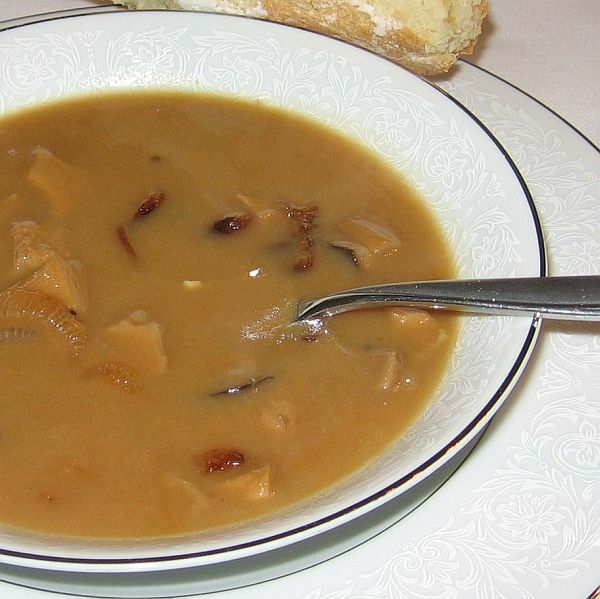 For Christmas Eve, the soup course for Slovaks who are Catholics typically is kapustnica, a sauerkraut soup with mushrooms, garlic, caraway, paprika, nutmeg, onions and apples or plums for a hint of sweetness. When the soup is served on a nonfasting day, pork and sausage are added to the cooking pot. In the eastern part of Slovakia, it is called jucha and is made only from sauerkraut juice mixed with dried peas, plums and, on nonfasting days, can include sausage. Where the cuisine has been influenced by the Orthodox Christian tradition of Ukraine, it is known as mačanka (also spelled machanka) as in the above recipe.